Lane Sainty reports on the shock relocation of the Hermann’s bus stop. Sydney University students have been caught by surprise after a popular campus bus stop was moved 80 metres down City Road. The stop, previously located outside Hermann’s Bar, was moved as part of the Inner West Bus Improvement Program, a NSW Transport initiative. It is now situated just under the City Rd footbridge, approximately 30 seconds’ walk towards Cleveland Street from its former location. A spokesperson from the Roads and Maritime Services (RMS) told Honi Soit the stop had been moved to address “safety and traffic flow issues”. “The [previous] bus stop’s location on a bend meant the longer ‘bendy buses’ could not stop parallel to the kerb, affecting safety for passengers and impacting traffic on City Road,” they said. The spokesperson added that the new stop is safer for passengers as it is situated on a wider part of the footpath. Exchange student Angharad Maggs from the University of Miami was waiting patiently at the Hermann’s bus stop when she found herself caught in the middle of the relocation. She told her story to Honi Soit. Regular bus riders have expressed a range of opinions over the move. Kate, a second-year psychology student, had only just realised the stop had been relocated when she spoke to Honi. “I think it kind of makes sense… Lots of times the bus drivers haven’t let me on when they’re waiting anywhere near the bus stop or for the lights to change. So maybe they’ve moved it to stop people doing that, knocking on the door,” she said. “I don’t mind the extra 80 metre walk, it’s making up for the exercise I miss out on by catching the bus,” he said. However, both Josh and Kate expressed disappointment at the minimalist ‘pole-only’ design of the new stop. Kate pointed out the lack of shelter at the new stop, labelling it “the only downside” of the abrupt move. Students have clustered under the high City Road footbridge during the recent rain, but the structure has proved an ineffective shield from the elements. However, the RMS said the problem could soon be fixed. 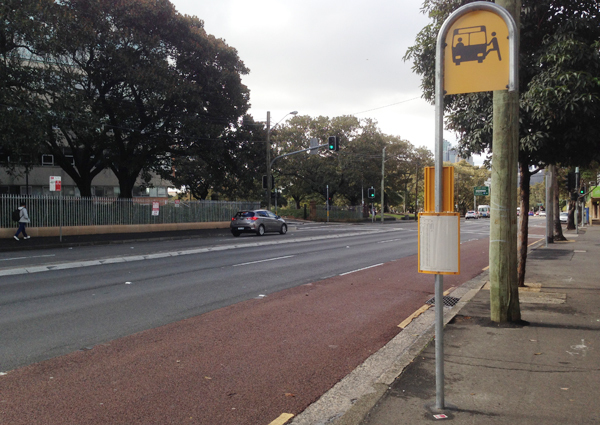 “[We are] liaising with City of Sydney Council about providing two bus shelters at the new stop,” a spokesperson said. Other students were dissatisfied with the location of the new stop, harbouring a preference for the former location which was adjacent to the traffic lights across to Eastern Avenue. Third-year Arts student Sayumi noticed the move after she waited at the old stop for 20 minutes, only to see her bus drive past. She thinks the relocation is unnecessary. Arts student Tom Gardner shares Sayumi’s concerns. He said it makes little sense to change the location of the most popular stop, rather than the less-used ones nearby.